El Port de la Selva is a seaside village in the comarca of the Alt Empordà in Catalonia, Spain. Overlooking a bay by the same name, the village is situated on the northern coast of the Cap de Creus and is an important fishing port and tourist center. for in this part of the coastline the mountain masses drop drown to the sea in sheer cliffs, majestically impressive and rugged, forming de Cap de Creus with the islands of Massa d’Oros and L’Encalladora before them. Then there are Isla Culleró, Punta de Moli, Isla Poraló, Punta dels Farrallons, Penyas Roges, Cap Gros, Punta Blanca, Punta de la Creu and many other steep rocks and islets. 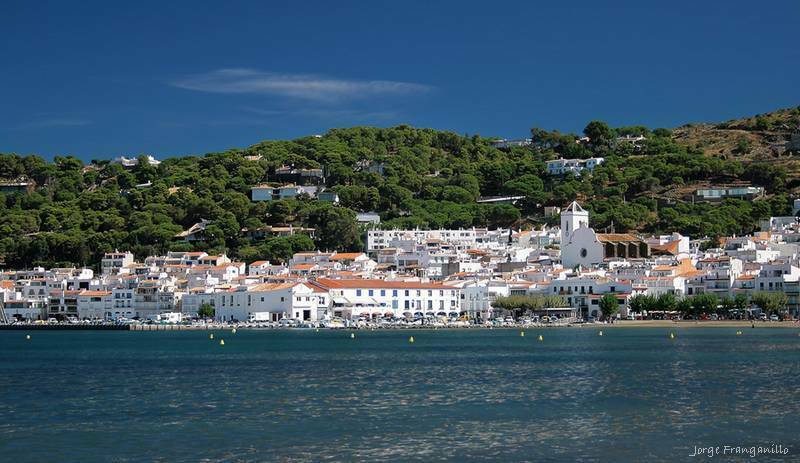 In the midst of all this ruggedness — remember, Costa Brava means ‘Wild Coast’ — El Port de la Selva is a haven of calm. You guessed it: El Port de la Selva started life as a fishing village, but the fishersmen from this part of the coast have for centuries lived in the village of Selva de Mar — three kilometers inland — where they alternated fishing with farming activities. Port de la Selva developed from this village. Fishing is still the village’s main source of income, but tourism also brings in a lot of money. El Port de las Selva is popular with wealthy Barcelonians, and — owing in part to its proximity to the border — to visitors from France as well. The population of about 1.000 people is swelled in the summer months by tourists, many of whom return so often than they have bought a house or apartment here. Platja Perabeua is a nice, pebble-stone beach in a natural setting of rocks and cliffs. The sand is clean and the blue water is crystal clear. Some houses and tents are visible, but there are no amenities. Bring a picnic basket. The beach can only be reached on foot and is somewhat of a climb down and later back up again. No lifeguards, no first aid post, and no toilets available. The main beach of El Port de la Selva fronts the village. The clean beach consists of a mixture of fine sand and pebbles. This beach includes a wide range of amenities and facilities. It is popular with wind surfers, and has on offer boat tours, jet skis, and para-sailing. First aid post, toilets and showers are available. This blue flag beach has plenty of nearby shops. The water at the beach is, for the most part, shallow making this an ideal beach for children. Aside from the usual beach activities, hiking in the area around town is very popular. There are numerous historical sites to see.